Sixth-grader Sariah Gutirrez was among those decrying the number of discarded needles near the Orchard Gardens K-8 Pilot School. They filed out of school at the final 2:30 bell Tuesday, but they weren’t headed home. 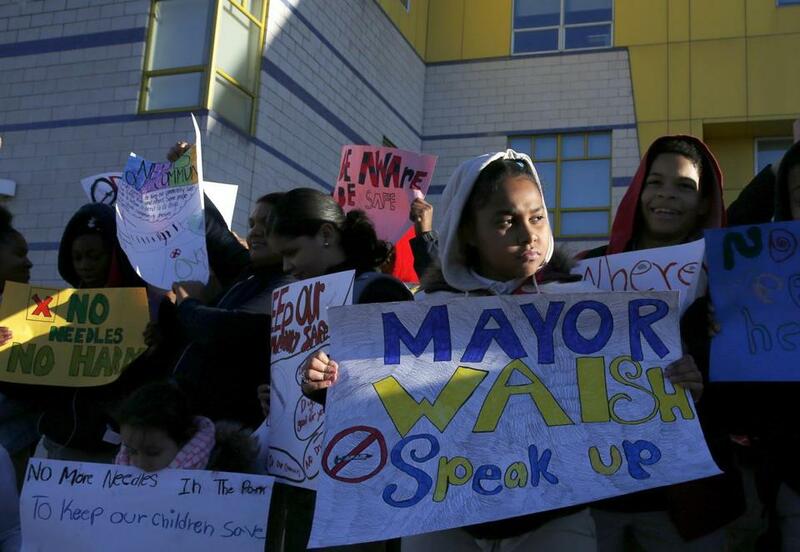 The students of the Orchard Gardens K-8 Pilot School in Roxbury wanted to send a message that they had had enough: enough of the dirty syringes that surround their school and playgrounds, and enough of official indifference to their safety. 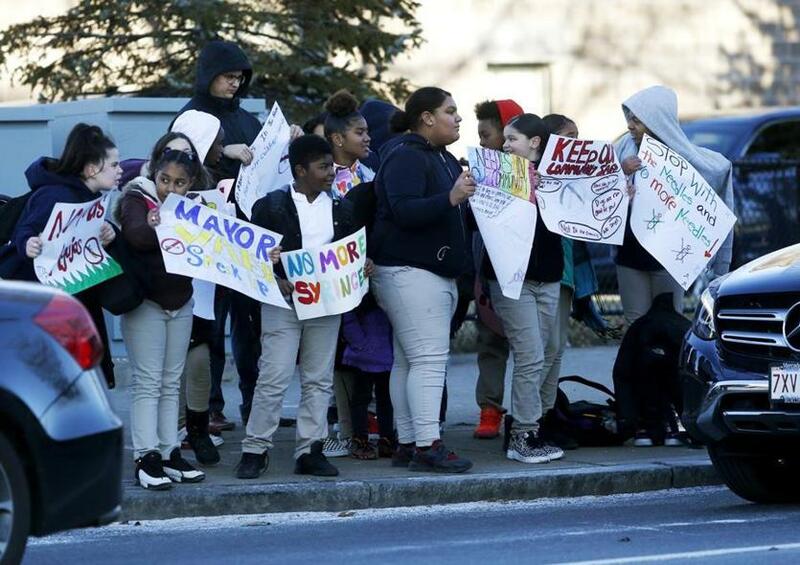 So they gathered at the corner of Melnea Cass Boulevard and Albany Street — along with their parents, many of their teachers, and some community activists — and held a protest. Some of them are 9 or 10 years old. The oldest ones, the eighth-graders — are maybe 14. All of them have been entering school through a minefield of discarded needles, a daily reminder of the opioid epidemic, and of the close proximity of Orchard Gardens to “Methadone Mile’’ on nearby Massachusetts Avenue. “THIS IS OUR SCHOOL. KEEP US SAFE,” they shouted, as traffic roared past. Some drivers passing by honked in approval. Shortly after the protest began, Boston police officers showed up to keep the kids on the curb and out of busy Melnea Cass Boulevard. Some of the protesters were in pigtails. The protest had been pulled together in a matter of days, but the issue has been festering for years. Orchard Gardens is located in the midst of several treatment facilities and needle exchange outlets, an area where the detritus of the drug epidemic is clearly visible. In fact, the protest wasn’t the first at the school. There was also one last year. A discarded needle was in the grass near the sidewalk outside of Orchard Gardens K-8 School. “There was no response to our first protest,” science teacher Julie Donovan said. How close are the needles to the school? Close enough for a student to get accidentally stabbed by one earlier this year. Sue Burchill, the school’s nurse, took me to a parking lot a few hundred feet from the school’s entrance. She immediately spotted two needles on the ground. She had known what she would find when we headed over. The needles are always there. So prevalent are the needles that she teaches kids — including first-graders — what they should do when they encounter them. “Stop, turn, and tell,” is her mantra. It’s on signs throughout the school, in three languages. Stop walking toward the needle, turn away, tell an adult. “I don’t tell them anything about addiction,” Burchill said. She just tells them to get away. There are multiple theories for why the needles are more prevalent than they used to be. There’s the needle exchange kiosk down the street. 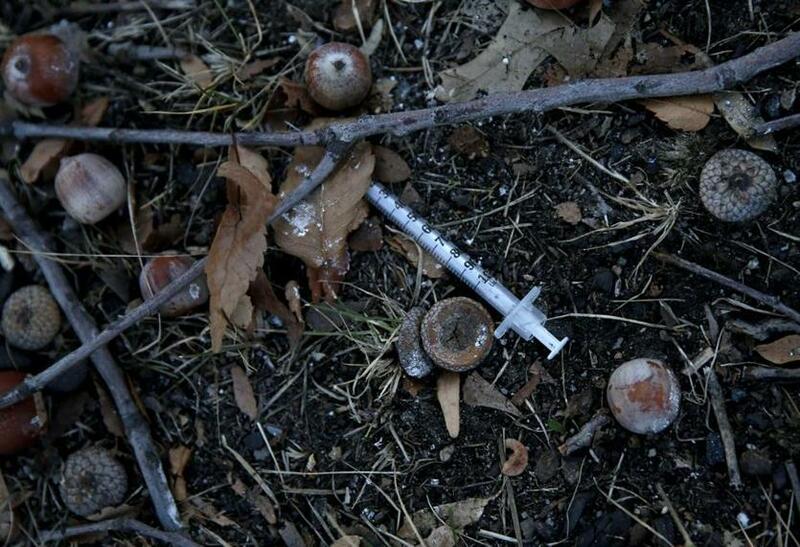 Some believe addicts who have congregated on Massachusetts Avenue are now getting pushed deeper into the neighborhood. Maybe there are simply more people shooting up. All of those are probably factors in the rise. Whatever the reason, they are an unacceptable feature of going to school. City officials were at pains to note that the opioid epidemic is complicated. They insisted that they are trying to keep the area around the school freed from needles. But clean needle distribution is also a core feature of the city’s outreach to people suffering from addiction. But that clearly isn’t good enough. Just after the rally ended, a group of parents and school personnel gathered just inside the school’s entrance. Janina Rackard, one of the organizers and the mother of a fifth-graded student, told the group how proud she was of what they’d just done. “Our children deserve to be safe,” she yelled. “We are done. If we have to do this every two weeks . . .” Her voice trailed off, as she choked up. All of us owe these children better. Students at Orchard Gardens K-8 School protested the prevalence of needles near their school building.